The term laser facial encompasses a wide range of non-surgical rejuvenation technologies designed to enhance skin tone and texture on the face and body. Our board certified facial plastic surgeon, Dr. Eugenie Brunner, is extensively trained in the most advanced laser techniques available. During your initial consultation, she can determine if a laser facial can optimize your outcome and which approach best suits your singular needs and goals. Broadly speaking, there are two kinds of lasers: ablative and non-ablative. Ablative lasers offer deeper treatment of common signs of aging and blemishes; however, they typically require a longer recovery. Examples of ablative lasers include Fraxel® Re:pair, MicroLaserPeel®, and Nd:YAG. Non-ablative lasers address milder skin conditions located on the surface of the skin. As a result, downtime is often shorter. The Fraxel® Dual, Clear + Brilliant, and FotoFacial® are examples of non-ablative modalities. Our laser facial is tailored to your needs and goals, and the procedure typically takes around 20-30 minutes, depending on the number of areas you want treated. Healing time will also vary based on the techniques used and your unique rate of healing. 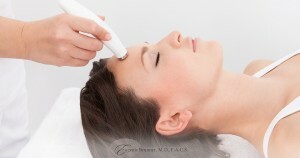 In most cases a series of laser facials will be recommended. Once complete, your skin tone and texture should continue to improve for weeks and even months. Want healthier, more youthful-looking skin? Talk to us today.